The first goal of a player’s season relieves that individual of the pressure that comes with being goal-less, while simultaneously bringing confidence that can help spark a scoring streak. 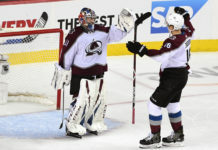 Avalanche forward Nathan MacKinnon scored his first Tuesday night against the Nashville Predators, and is both relieved — and confident he has a lot more on the way. The goal came off of a fortuitous bounce in which MacKinnon’s pass to Sven Andrighetto was redirected by Predator defender while on the power play, but MacKinnon believes more goal production is to follow. “It was a lucky one. I’ll take it, though. 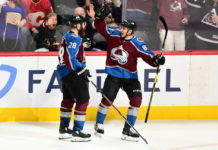 Obviously, it feels nice getting one to get that out of the way before I get rolling here,” MacKinnon said following practice Wednesday afternoon. MacKinnon has faced some criticism due to his lack of point production, particularly from national/Canadian media. 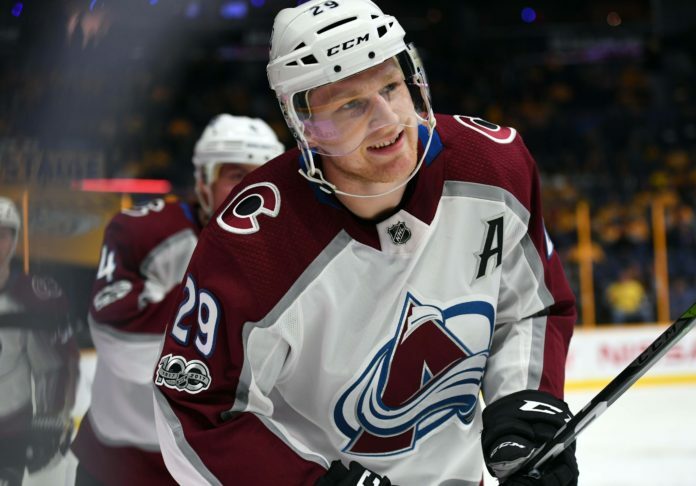 Through seven games played, however, MacKinnon has a goal and four assists. If you disregard the Anaheim game, he is almost at a point-per-game pace. MacKinnon is not concerned with his point production, just yet. MacKinnon has been shooting the puck at a much lower rate than usual. In his career, MacKinnon averages 3.06 shots per game and is on the ice for 14.8 Corsi For — an advanced measurement of offensive puck possession. Through seven games, one of which he only logged 4:29 of time on ice, he has averaged 1.57 shots and has been on the ice for 10.43 Corsi For per game. He is aware that it is an issue, and knows what has to change. MacKinnon’s goal did come on the power play, where one-fourth of Colorado’s goals have come from this season. 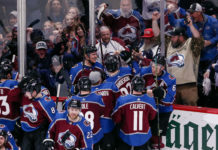 The Avalanche have scored five goals with a man advantage, which puts them tied for 11th in the NHL for power-play goals with seven other teams. MacKinnon does acknowledge, however, that the five-on-five play must be improved upon. MacKinnon and Mikko Rantanen remain line mates and, as of Wednesday’s practice, will have the addition of Tyson Jost to work with. On a line loaded with talent, all three are looking to find more offensive production, and coach Jared Bednar hopes they can help spark one another. Goal production from a top line such as this one will be pivotal in continuing the success the Avalanche experienced early on. It is clear MacKinnon feels he is ready to unleash himself offensively. Now in his fifth season with Colorado, it’s time for him to put the offensive responsibility on his shoulders and become the elite goal scorer he is capable of and expected to be. He definitely has the confidence and the skill… and he know’s it’s time to execute.